Creative Blueprint Seattle presents Deconstructions. 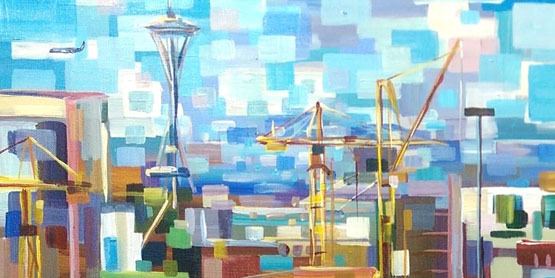 Join us at our Capitol Hill location to explore and celebrate a much anticipated exhibition of paintings by Brooke Borcherding. This grouping of both current and past paintings showcases Brooke’s trajectory of studying from nature (en plein air) to her experimentation with blocks of color in the studio. See the reveal of Brooke’s process of painting as she breaks apart the traditional landscape and forms a unique way of experiencing a depiction of a place in a deconstructive style.